Rus Bradburd will be talking about his biography of Nolan Richardson tonight. 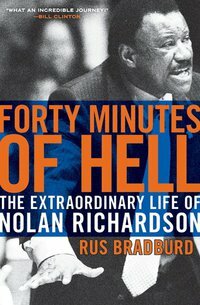 I won’t be able to make it tonight, but Rus Bradburd will be speaking about Forty Minutes of Hell, his well-written and enjoyable biography of Nolan Richardson, at the No Exit Cafe tonight from 7:00 p.m. to 10:00 p.m. Following the book discussion will be a brief screening of highlights from the film Basketball in the Barrio, which deals with a program Bradburd directs in the “Segundo Barrio” neighborhood of El Paso, where Nolan Richardson grew up. I’m disappointed I won’t be there to meet Rus in person, and I look forward to hearing from dear friend and uber-connector Danny Postel how it went.